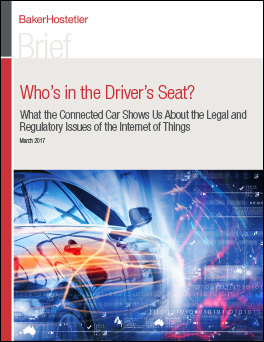 The revolutionary wave of IoT-enabled devices – in cars, homes, businesses and much more – carries significant challenges for the creators of intellectual property, innovators using wired and wireless communications technologies, and businesses complying with complex regulations. Our nationwide team has the technical background, business acumen and legal experience to help clients successfully develop, market and deploy complex IoT technologies. In fact, we’ve been helping clients succeed with IoT since before it was a buzzword. Within our Intellectual Property Group we have more than 100 attorneys who hold technical degrees in computer science, information technology, and electrical and computer engineering. We provide sophisticated guidance in patent prosecution and litigation proceedings. Our nationally recognized Privacy and Data Protection team is at the forefront of developing the legal frameworks in this arena and is known for its breach response work and proactive compliance training. We have assisted clients in negotiating and closing dozens of IoT-related deals, working with state and federal agencies in the United States as well as international regulatory and licensing bodies. Our Communications Team includes FCC representation of cable operators, internet service providers, communications device manufacturers and television broadcasters. We offer clients regulatory and transactional guidance in complying with complex and day-to-day matters – and everything in between. Advised a joint venture between a wireless technology company and a Japan-based conglomerate which conducts research and development in the fields of machine-to-machine (M2M) communications and the Internet of Things. We advise the company on all its intellectual property management and the strategic development of its patent portfolio. In a year, we filed close to 100 new patent applications for the joint venture. Represented a home automation company that designs and manufactures sensor-driven, Wi-Fi-enabled, self-learning, programmable thermostats and smoke detectors in a significant patent infringement suit involving environmental hazardous condition alarm systems and smoke alarm systems. Counseled Dassault Systèmes S.A. on the U.S. aspects of its purchase of a controlling interest in Realtime Technology AG (RTT) for $245 million. RTT provides professional high-end 3-D visualization software, marketing solutions and computer-generated imagery services. Advised a major vehicle manufacturer regarding the implementation of telematics systems in its trucks. Telematics monitors and then optimizes the performance of vehicles based on geolocation data and other information. We evaluated how state laws regulate Event Data Recorders (EDRs) and how other privacy laws may create legal risk for the company. We also advised on necessary disclosures, notices and other practices that would mitigate legal risk for the company when it uses telematics technology. Advised a leading semiconductor company in its settlement negotiations with two technology companies. Our team has conducted a comprehensive review of the portfolios of all three companies, including several hundred patents, to help determine what the terms of a settlement may be. We attended multiple meetings in Tokyo to negotiate these matters. Also, in the past year, our team has defended three patent litigation matters in the Eastern District of Texas. All three cases involve semiconductor technologies in various fields, including automotive microprocessors and graphics processors. Damage demands in each were upward of $10 million. Represented a major automobile device manufacturer before the FCC in multiparty connectivity enforcement matters. We advised on potential compliance concerns regarding spectrum use, and evaluated broader device compliance, including FCC Part 15 device compliance.